South Korea’s biggest cosmetics maker is revamping its products to suit Muslims and darker-skinned women in Southeast Asia as it tries to make up business lost because of political tensions with China over a missile-defense system. Amorepacific Corp. is pushing harder into Indonesia, Singapore, Malaysia, Thailand and Vietnam with a lineup that takes into account skin tones, the region’s humidity and the need for Muslim women to wash their faces five times a day before prayers. It marks a significant shift for the Seoul-based company, which generated about 90 percent of its revenue last year in South Korea and China — where many women are fairer-skinned and the weather more variable. Southeast Asia generated just 150 billion won ($133 million) in sales for Amorepacific last year, or less than 3 percent of its total. 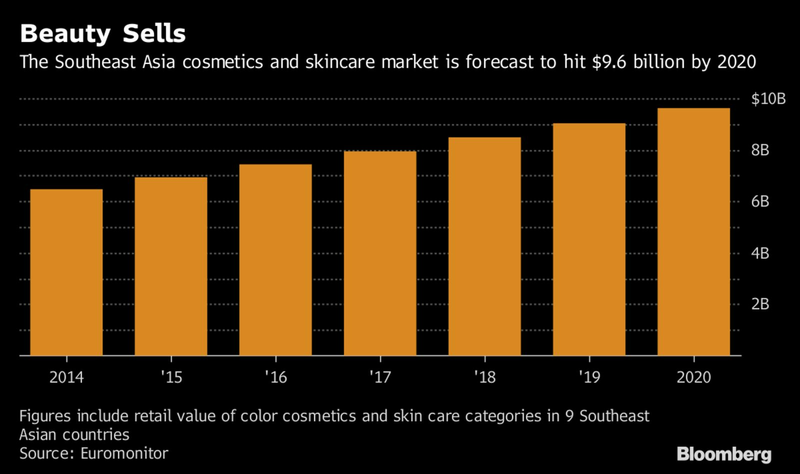 The company wants to triple that, given the region’s cosmetics and skincare market is expected to reach $9.6 billion in sales by 2020, according to Euromonitor. The move is spurred in part by tensions with China over South Korea’s hosting of the U.S.’s Thaad missile system, meant to protect against a North Korean attack. China opposes the system and, in the immediate aftermath of its deployment, travel agencies stopped selling tour packages to South Korea, where consumer products are hot items. There were 2.3 million fewer Chinese tourists in the five months through July, compared with a year earlier. Based on the average spending of Chinese visitors in 2016, that cost South Korea at least $4.7 billion. That may be especially significant for Amorepacific since China accounted for 19 percent of revenue in the year ended Dec. 31. Shares have declined about 21 percent so far this year, compared with a 19 percent increase for the benchmark Kospi index. The stock gained 0.8 percent in Seoul on Tuesday. 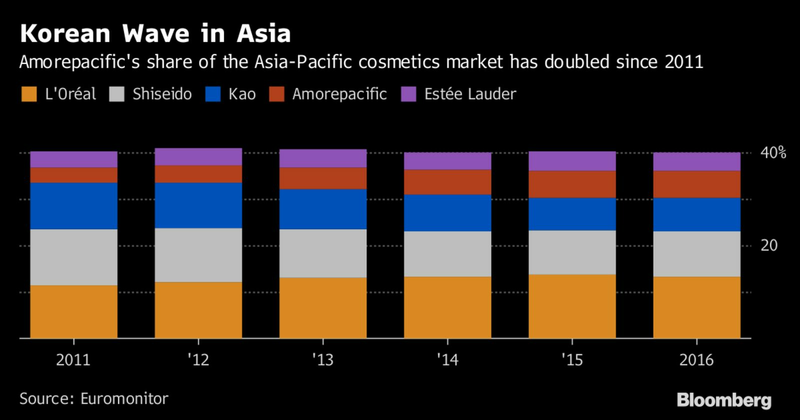 Amorepacific’s share of the Asia-Pacific cosmetics market doubled to 6 percent between 2011 and 2016, overtaking Estee Lauder Companies Inc., according to Euromonitor. Now it’s focusing efforts in Southeast Asia, primarily through five brands: Laneige, Innisfree, Etude House, Sulwhasoo and Mamonde. Amorepacific has about 250 directly managed stores in the region and plans to open another 150 to meet its 2020 revenue target, Na said. The company opened a research center in Singapore this year, and it’s investing 110 billion won to build a production facility in Johor, Malaysia, that’s scheduled to open in 2020. The Muslim population in Southeast Asia totals close to 300 million, according to Abas Jalil, chief executive at Kuala Lumpur-based consultancy Amanah Capital Group Ltd.
By 2019, the annual global spending by Muslim consumers will reach $73 billion, according to the Singapore-based Institute of Asian Consumer Insight. More than 60 percent of the world’s Muslims live in Asia. L’Oreal SA, the leading cosmetic maker in Southeast Asia, is also tapping into the Muslim cosmetics market. It operates a halal-certified factory in Indonesia that supplies to the region. Halal products don’t have components that Muslims are prohibited from consuming or using according to Islamic law. Yet the company isn’t just cutting-and-pasting its operations from northern Asia. It’s reformulating certain products and creating new ones to compensate for humidity, darker skin and Muslim women’s needs. For example, Muslim women want lighter, washable makeup that can be removed easily before daily prayers and then quickly reapplied. Norhayati Hamim, a customer in Singapore, said she favored the premium Sulwhasoo brand, particularly the $36 Gentle Cleansing Foam EX face wash she uses before daily prayers, because it doesn’t dry her skin. “Their makeup is not too thick, too, so it’s easier to wash off,” she said. Also, Muslim customers who wear hijabs tend to want to highlight the areas of their faces that are revealed, Na said, meaning they want more vibrantly colored lipstick and eyeshadow. The company wouldn’t provide details about specific colors, citing competitive reasons. 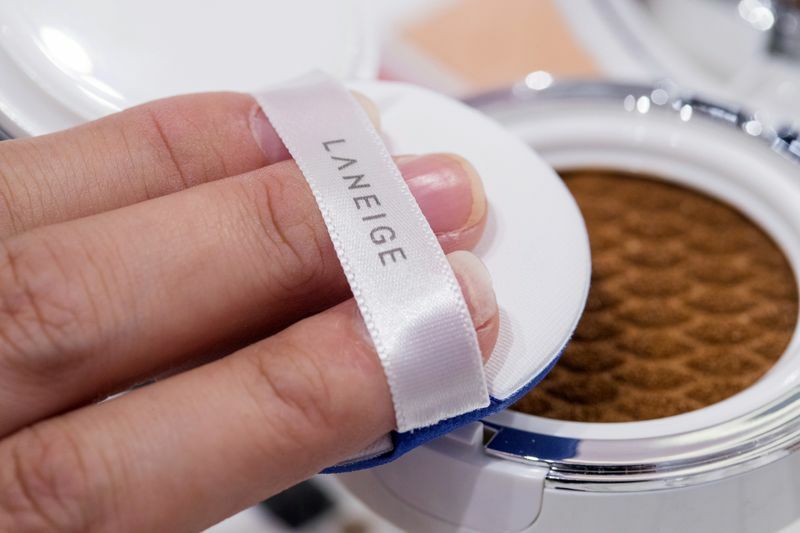 The company has, though, developed darker shades of foundation, called “Asean cushion shades,” for its Laneige and Innisfree brands that are sold only in the region. “We are also very open to developing local-only products,” Na said in Korean, with his comments translated into English by a company-provided interpreter. Besides focus groups, Amorepacific’s representatives also visited the homes of Muslim customers, mostly in Kuala Lumpur, to better understand their makeup and skincare management routines. The customers are enlisted by market-research firms such as Nielsen Holdings Plc., according to Amorepacific. 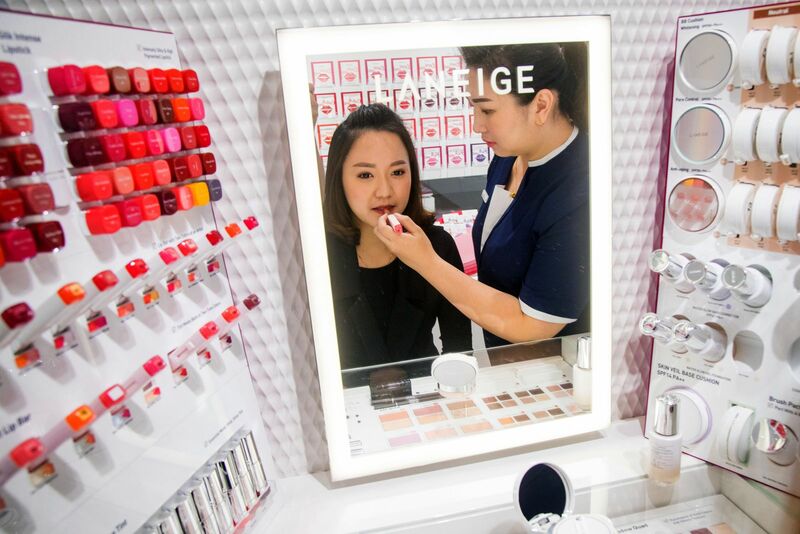 During the visits, a female researcher notes the steps in a customer’s morning regimen, whether products are applied to the neck, and even how many times a woman taps the makeup with the application pad. “Brands must be confident in their understanding of Muslim consumers and combine that with a nuanced understanding of how the faith exists in the context of different cultures,” said Q Akashah, Singapore-based executive director at Islamic marketing consultancy OgilvyNoor. 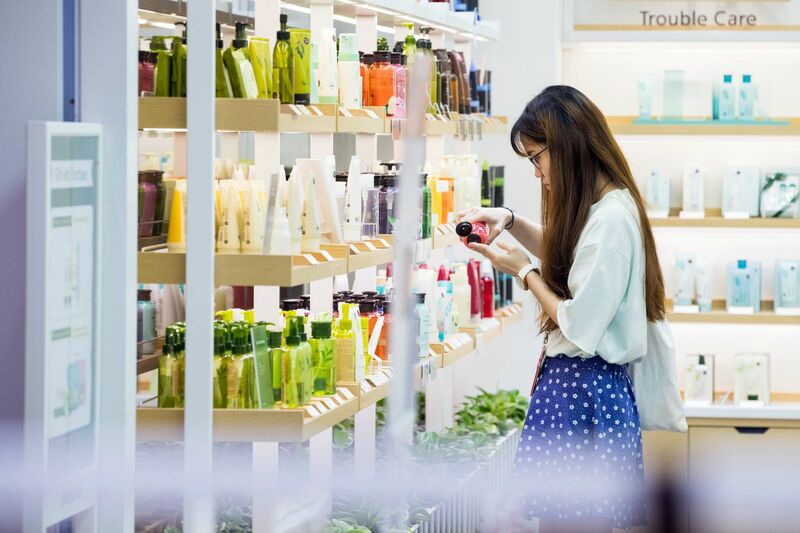 Amorepacific believes that the knowledge they’ve picked up in conquering the diverse Southeast Asia market could prove helpful for ventures into other new markets. The company this month opened an Innisfree store in Manhattan. “If we can achieve success in Southeast Asia with this much diversity, it can also be a very good experience for us to enter different countries with great diversity as well,” Na said.